Shasta Lake browns are back on the bite! Shasta browns are back in their fall/winter migration pattern and we are catching them now! A November full moon and a water temperature drop into the high 50’s has finally kicked off the fall/winter migration pattern. a lot of browns spawn in October in the upper tributaries and we’re seeing those fish going back into the system. We will also see browns headed up river to spawn through the winter months as well. When we’re chasing big weary browns, the bites are few and far between, but some days we’re surprised by a good number of bites. A good day in my book is a brown trout per rod, but sometimes clients will hook 2 or even 3 big browns each. Either way, just one of these big browns can be, and is a fish of a lifetime for most people who fish with us. Great fishery for the kids because no skill or experience is required to catch these big trophy browns. It can be a game of patience, but the rainbows usually keep us busy in-between yje big bites we’re after! The brown fishing should hold steady if the water conditions stay fairly green and free from a lot of debris. Theres almost always somewhere on Shasta where we can find clean water though. The brown trout fishing has been great the past few years after a big hatchery plant about 4 yrs ago. CDFW has tripped over a gold mine and they have acknowledged the value of this fishery by ramping up the numbers of browns planted in Shasta Lake this year. 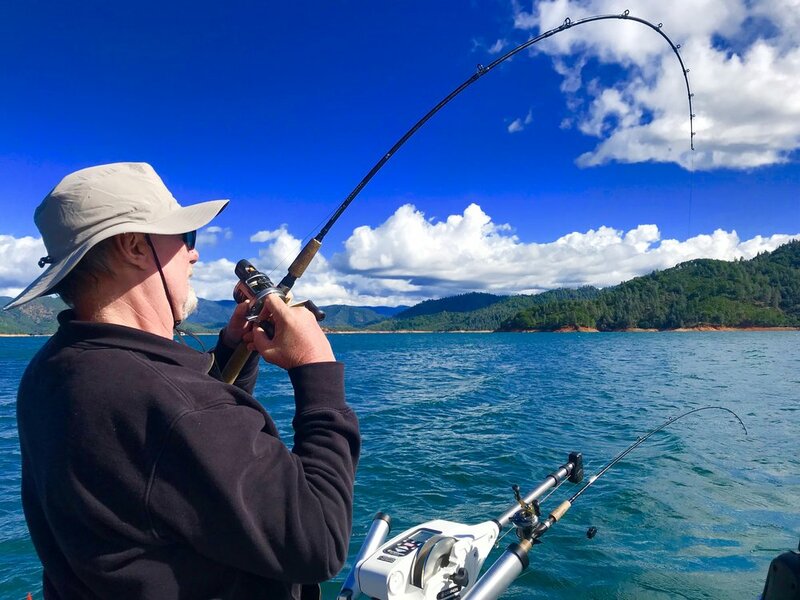 They have already started planting catchable size browns in a few areas of the lake and have also begun to fill some of the net pens at some of the Shasta Lake marinas. Three nice Shasta Lake browns for this young man today! With a naturally re-producing population of browns in Shasta lake augmented with tens of thousands of hatchery planted browns, Shasta Lake will undoubtedly become the top brown trout fishery in the west. Its likely already holding the title, its just been flying under the radar for several decades. As word gets out and anglers begin to realize just how good the fishery is, we will likely see a surge in the number of anglers we will see fishing for them. Its a big lake, and in my opinion, it can handle the pressure a lot of smaller bodies of water simply can’t. From a professional standpoint, I’m really happy to see the attention Shasta is getting and my business on the lake has blown up in just a few years. I know its boosting local business, both on and off the lake, and its looking like a big win for everyone who’s been touched by the presence of these very popular sport fish. Brown trout #4 for the Moore boys today! The yearly cycle for these browns for me begins in November. I fish them through the winter months as they migrate up and down the different arms of the lake. By February, most of the browns are back in the lake and can be found in the different areas they occupy before moving down to the main body of the lake when the water begins to warm and the shad schools move into the main body of the lake as well. By early summer, just about every area of the lower lake will hold brown trout. You can hunt them near structure where they hand out waiting to ambush their prey, or you can look for actively feeding browns amidst the shad schools out in open water. By summers end, the browns head up the channels towards the cool waters of the spawning grounds in the headwaters of Shasta Lake and seemingly disappear until November when the whole cycle starts all over again. If catching big browns on one of Californias most spectacular bodies of water is of interest to you, don’t hesitate to get in touch with me and I’ll do everything I can to help you catch a big brown trout you’ll never forget! I have lots of available dates during the winter months but if you’re looking for a prime date in the spring or early summer, booking sooner than later is your best bet. Especially if your time to fish is limited. I take deposits on distant reservations only, and if for some reason I believe the fishing won’t be good or conditions are poor, I’m happy to reschedule your trip or refund your deposit without hesitation. I believe its going to be another great year and its only going to get better in the years to come. Tight lines! Newer Post2019 Sacramento ISE Show Jan 17th-20th. Older PostSac River Late Fall King salmon is fishing wide open!